As one of the leading innovators of hard disk drive technology, Western Digital lead the effort in getting the new Advanced Format hard disk drives out into the market. But what exactly is Advanced Format, and how does that benefit us? Hard disk drive capacity have increased exponentially, from mere megabytes to gigabytes, and now terabytes. However, the ability to squeeze more data into the same physical space has been hampered by the age-old sector size of 512 bytes. This is where Advanced Format comes in. To improve capacity, hard disk drives must change the size of the sectors so that they store 4,096 bytes (4 KB) instead of just 512 bytes. The 8-fold increase in sector size increases the amount of data that can be stored in the same space by 7-11%. In other words, Advanced Format drives can squeeze in 7-11% more data into the same platter as non-Advanced Format drives. Take a look at the comparison on the right. In a legacy (non-Advanced Format) drive, each sector begins with a Sync/DAM header, followed by 512 bytes of data and ending with an ECC (error correction code) block. There is also a small inter-sector gap before the next sector starts. 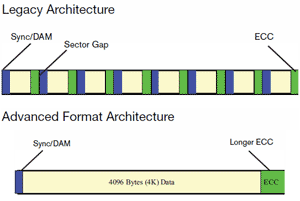 The Advanced Format sector starts with the same Sync/DAM lead-in but follows that with 4096 bytes of data. It also uses a longer ECC code block, which allows for both better data integrity as well as higher efficiency (there are fewer ECC bytes for the amount of data protected). The new 4 KB sector does away with 7 of the Sync/DAM headers and inter-sector gaps. Its single, large ECC block is also much smaller than the 8 small ECC blocks used in the legacy sector combined together. This is basically how Advanced Format allow for further increases in drive capacity. Advanced Format can also help the industry get beyond 2.1 TB capacity limit, which was brought about by the LBA addressing limit in 32-bit operating systems. These operating systems can only support up to 4.29 million sectors, which translates to 2,199,023,255,552 bytes if each sector is 512 bytes. The only way to get around this is to upgrade to 48-bits Long LBA, which supports up to 144 petabytes, if each sector is 512 bytes. However, this solution requires the use of a newer 64-bit operating system (e.g. Windows Vista, Windows 7, Mac OS X) and a motherboard that supports UEFI. In other words, it's pretty much out of reach for most people right now. By switching to 4 KB sectors, the industry will have an easy way to bypass this limitation, immediately allowing for drive capacities of up to 17.5 TB for current motherboards and 32-bit operating systems. That makes it a great interim step to a full LBA upgrade. It also expands the supported capacity of Long LBA from 144 petabytes to 1152 petabytes.